How 318 Studio set about designing a landscape for learning, where the natural and the architectural connect to create a new shared habitat for the exploration and occupation of inquisitive visitors and wildlife alike. Leaving the urban confines of their West London office for a breath of Kentish air the design team’s initial visit to the nature reserve revealed 75 acres of stunning lakes, mixed habitat ponds, reed beds and woodland. They discovered that the reserve is renowned for its birds with more than 2,000 identified species visiting on a regular basis. Research also unearthed the nearby Dryhill Local Nature Reserve. This geological center, also originally a stone quarry, housing rock formations and fossils, along with a study of the vernacular architecture of the area would eventually feed into the team’s design narrative. Back at base the proposals began to take shape. Central to the ethos was that the natural and the architectural should connect, overlap and co-exist in as harmonious a way as possible. The silhouette was designed to create a balanced composition between building and landscape. The main structure, reminiscent of a geological form, was conceived as emerging from the site like a ridge of exposed bedrock, a recognizable profile yet sensitively low lying and nestling within its surroundings. 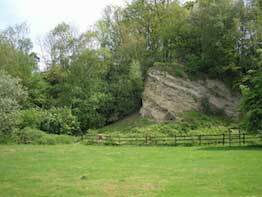 From Kent through what is now Sussex, there are ranges of chalk hills – the North and South Downs – and, as a result oak and clay form the basic materials in many of the areas buildings. This historical detail along with the site’s original use as a quarry, influenced the proposal of introducing a ridge-line of rammed chalk wall structures. Projecting timber trusses and carpentry were proposed to form roofs, walls and enclosures. 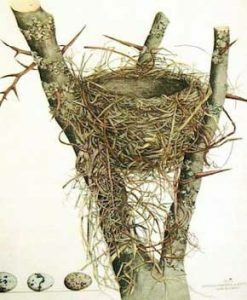 Recalling timber framed barns and farm buildings, the woven timber textures evoke not only thoughts of interwoven hazel wattles but also birds nests. With regard to interaction with the natural world, space is made for bats to roost in the taller chalk walls along with artificial nesting cavities formed where people can engage with the wildlife which itself is envisaged as being nurtured by the building. This respect for the rural landscape was uppermost in the minds of the design team in the formulation of their design for a House for Nature. An overriding concern was that the structure was seen as being embedded in the landscape and in harmony with the visual aspect of the original site. Re-use of existing infrastructures were proposed to protect /minimize disruption to the existing reserve during construction. Glazed areas that face out onto the lake were designed with low set eaves to minimise light emission / impact to the lake and prevent collisions with wildlife. The design team for a House for Nature comprised: Alexis Germanos, Jonathan Paul, Tim Cambridge, Victor Li and Dimitra Drizou.